I conceived the idea for this project during the summer of 2010 in Peru, while my travel partner and I were on a bus on a rocky, windy, dirt road somewhere in the very rural part of the country. It was an ongoing joke between us that all the budgeting of our time we had done before the trip was worthless, since some things took much longer or shorter than our estimates. In the most egregious case, I thought that since the city of Chachapoyas was only something like 50 km both from a waterfall and from a large fortress, we could see one in the morning, the other in the afternoon, and then check out part of the city in the evening. In fact, it turned out that because of the terrible road quality and the only sporadic availability of transport, the falls alone took an entire day and the fortress was an overnighter. This trip took way longer than we thought. This got me thinking that the maps we were relying upon had been in a certain sense misleading. For human beings, two locations are far away from each other not if they are separated by many miles, but rather if it takes many hours to travel between them. Physical maps can misrepresent geography because some locations appear close but are in fact far, and some locations appear far but are in fact close. On that bus I had this idea: What if you could take a map and transform it so that the distances on the transformed map were aligned more closely with travel times? This transformed map would then be a more honest representation of the geography for human purposes. We ended up choosing to transform a map of the Washington DC area instead of Peru or some other place because most of the area on an image of Washington is accessible by car, (unlike, Peru, which has a lot of jungles, mountains, and rural areas, or a coastal city, with the ocean nearby). The reason it's hard to use a coastal city or an area with a lot of wilderness is that the time distance between two points, if one of them is in the wilderness or water, is huge, (you'd have to walk or swim). As a result, on the transformed map any wilderness or water areas should "blow up" to represent the large time-distance to and within them. 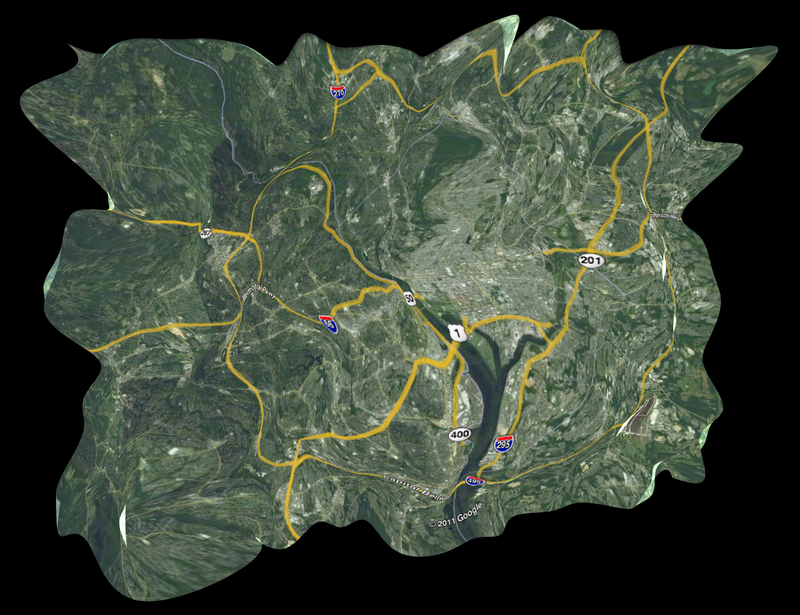 This would make the resulting map uninformative (and look dumb). Here are the final "before" and "after" pictures; the rest of the post goes into details of how we implemented this. 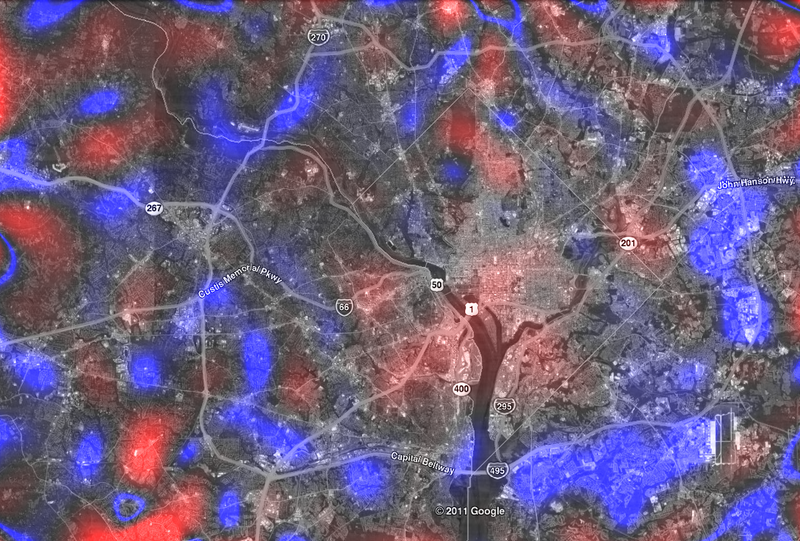 A satellite view of Washington DC and the surrounding area. 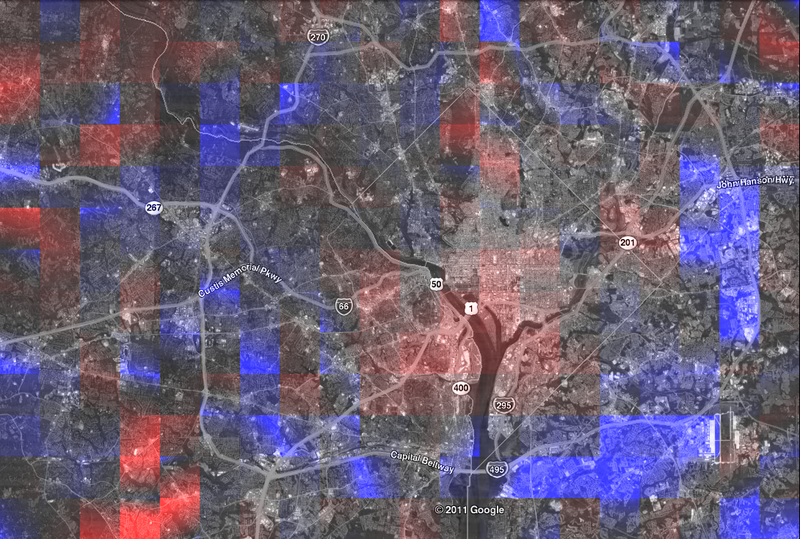 Washington DC transformed according to travel-time distances. 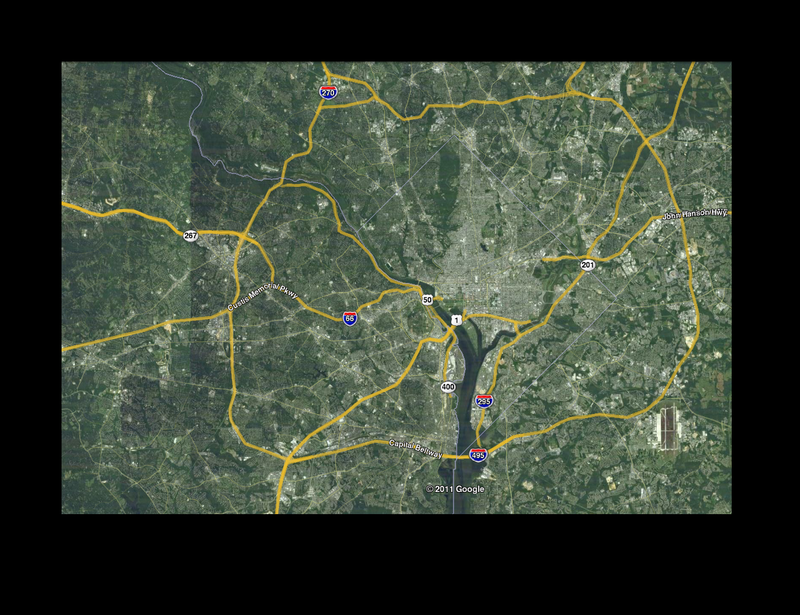 Some of the more intuitive features of this transformation are that the two east-west freeways on the west part of the map contract, the beltway scrunches up, and the Potomac river expands. First, we needed to collect a lot of data on travel times. We did so by writing a script to get travel time estimates from Google maps. We obviously couldn't get the travel time from every location on a map of DC to every other, so we overlaid a 21 x 14 rectangular grid on top of Washington and only queried the travel times between grid points. We didn't assume that the travel time from A to B was the same as from B to A, so in the end we had to make some 86,142 queries. The 21 x 14 grid points. 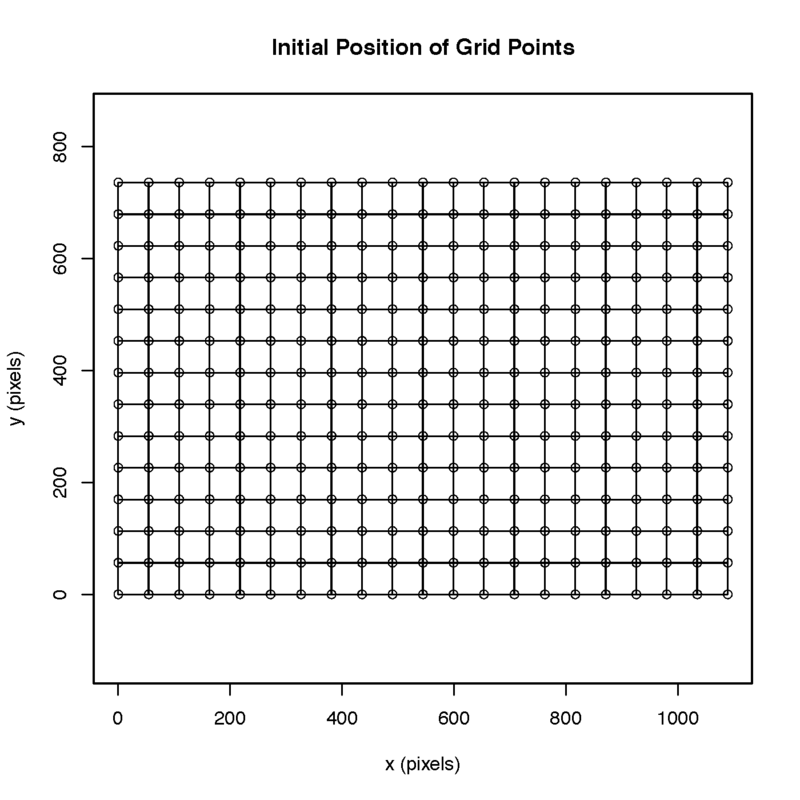 The optimal transformation of the grid-points under one objective function. 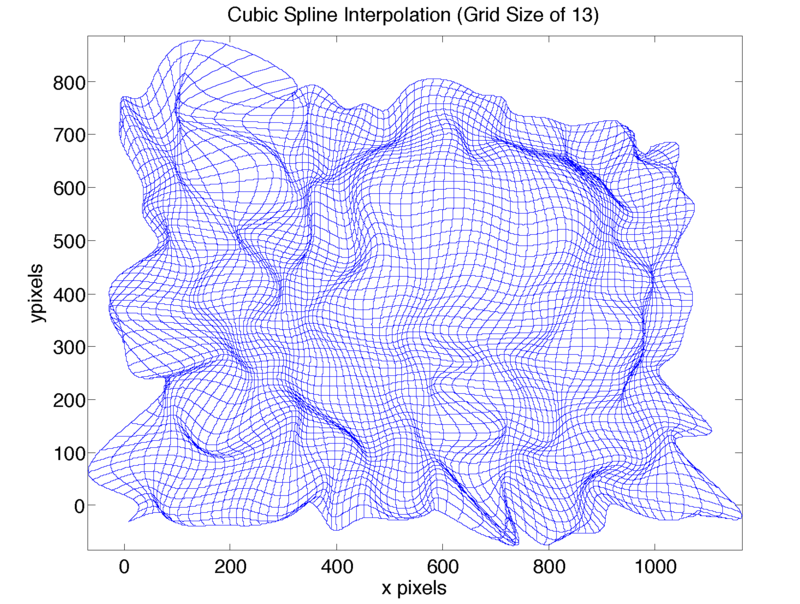 The optimal transformation of the grid-points under another objective function. The optimal transformation of the grid-points under still another objective function. 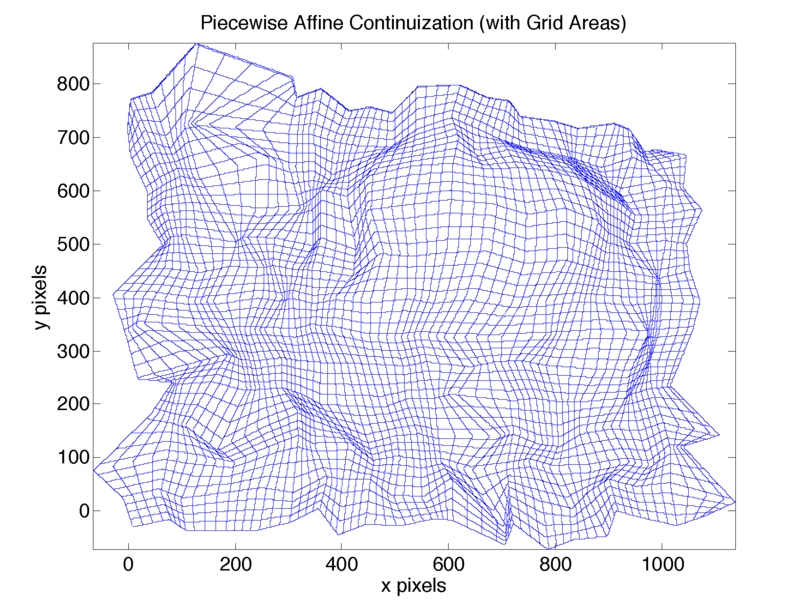 The grid-points transformed under "negative cosine minimization". (The plot is mis-titled). 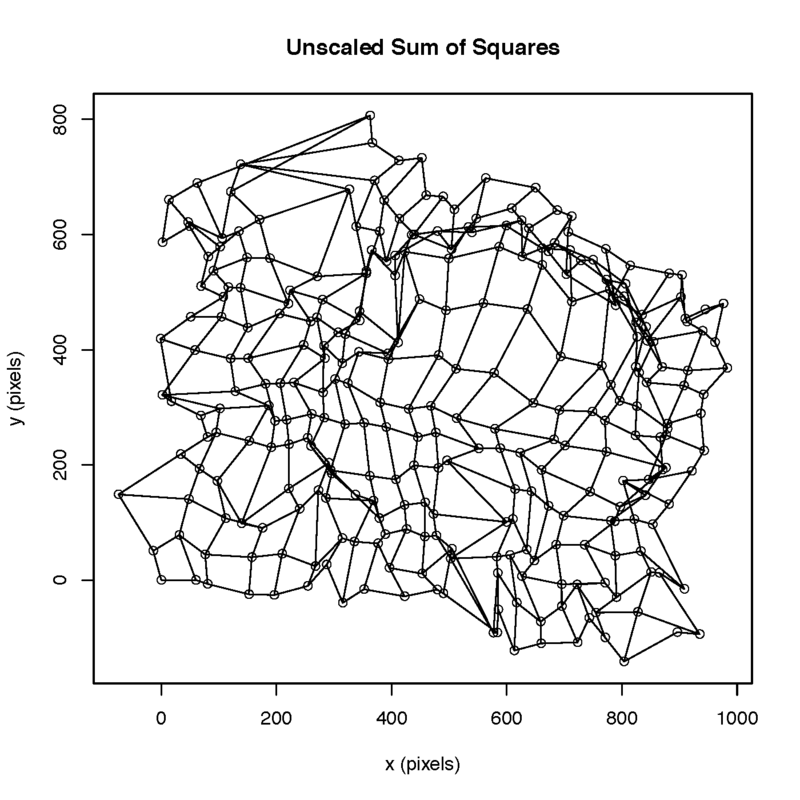 Unfortunately, solving this optimization problem without any constraints on the new locations of the grid-points yielded ugly transformations, with folding over of grid lines that is hard to interpret. (You can see this particularly in the top beltway region in the above transformation, as well as some in the left part of the beltway and the top-left corner of the map). 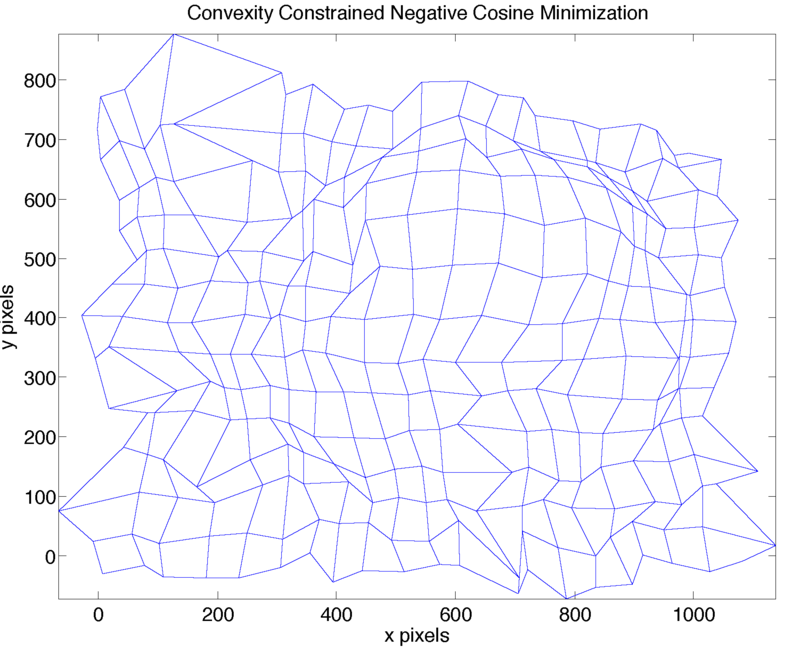 The grid-points transformed under "negative cosine minimization", but constrained so they don't fold-over. Extrapolating to a piecewise affine transformation did not have a continuous Jacobian and thus looks a bit "patchy". 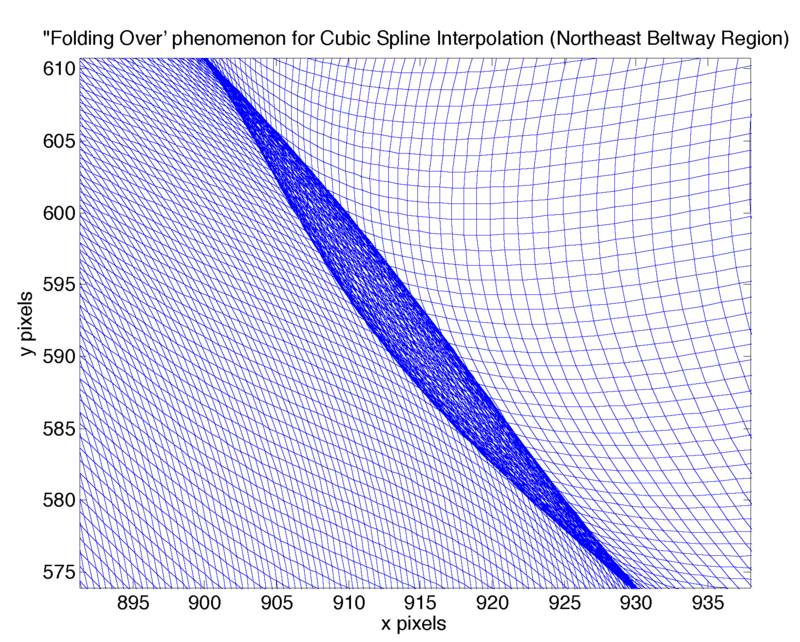 Extrapolating the transformation with cubic spline polynomials. 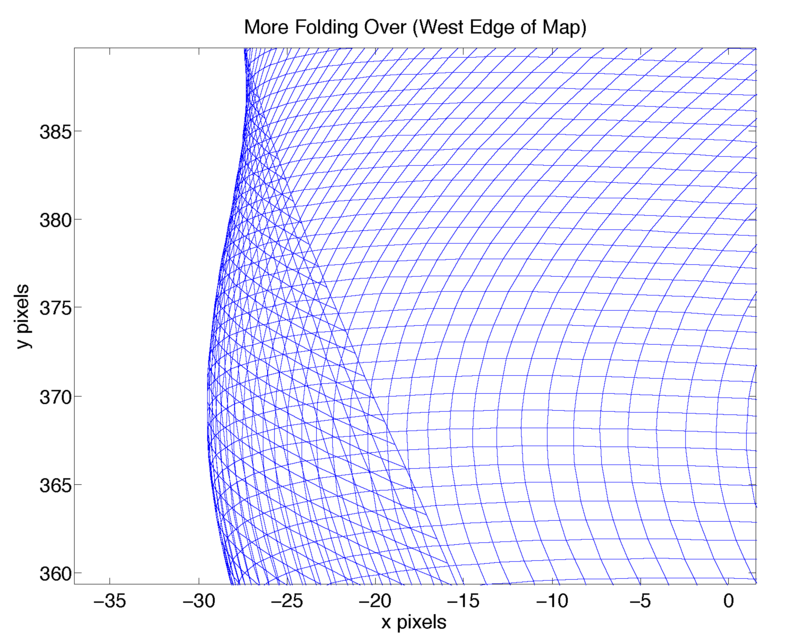 Zooming in on spline-induced "folding over." Zooming in on more spline-induced "folding over." Zooming in on still more spline-induced "folding over." We decided that "patchiness" is better than folding over, so picked the piecewise-affine extrapolation rather than the cubic-spline extrapolation. 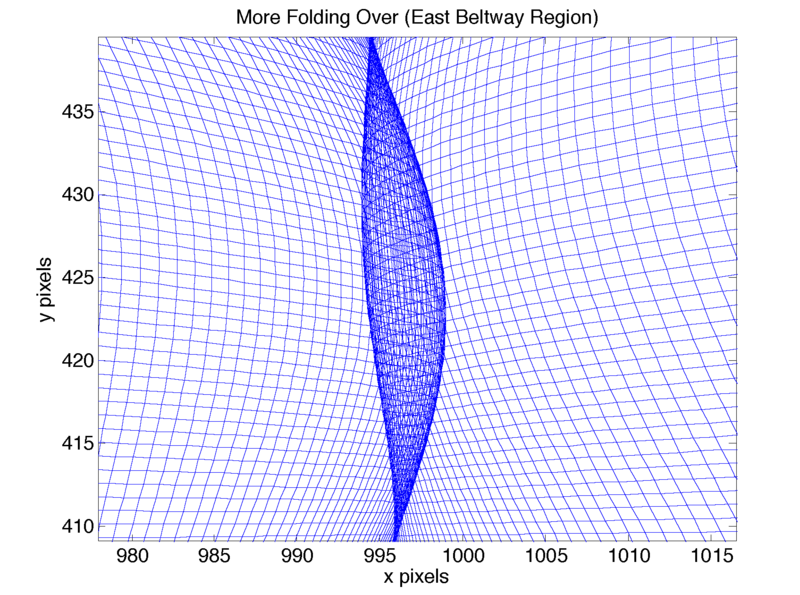 Washington DC transformed according to travel-time distances, (piecewise affine extrapolation). 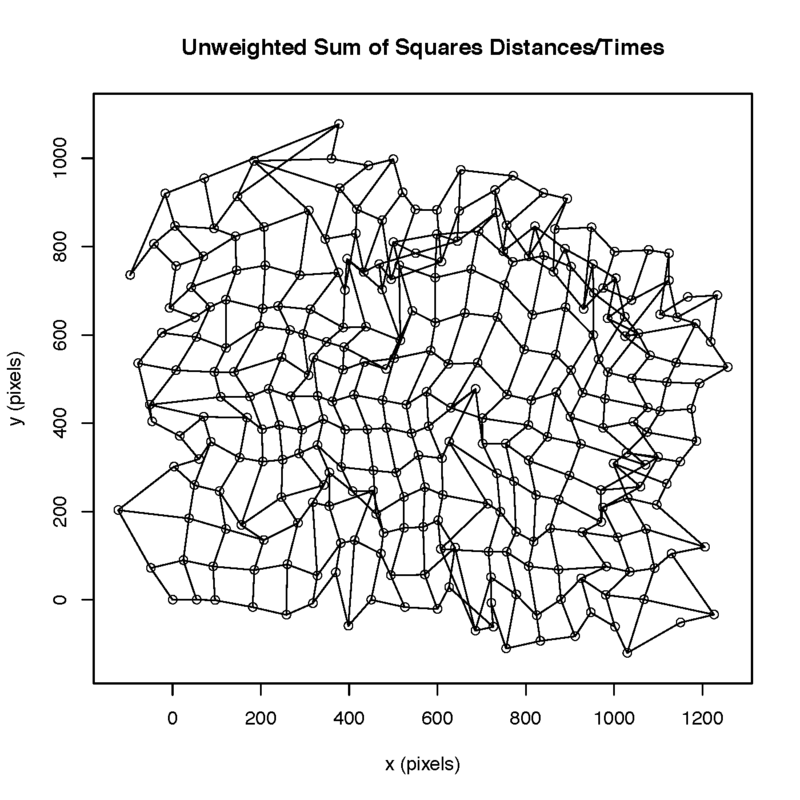 Washington DC transformed according to travel-time distances, (cubic spline extrapolation). The abnormally light areas are due to folding-over. 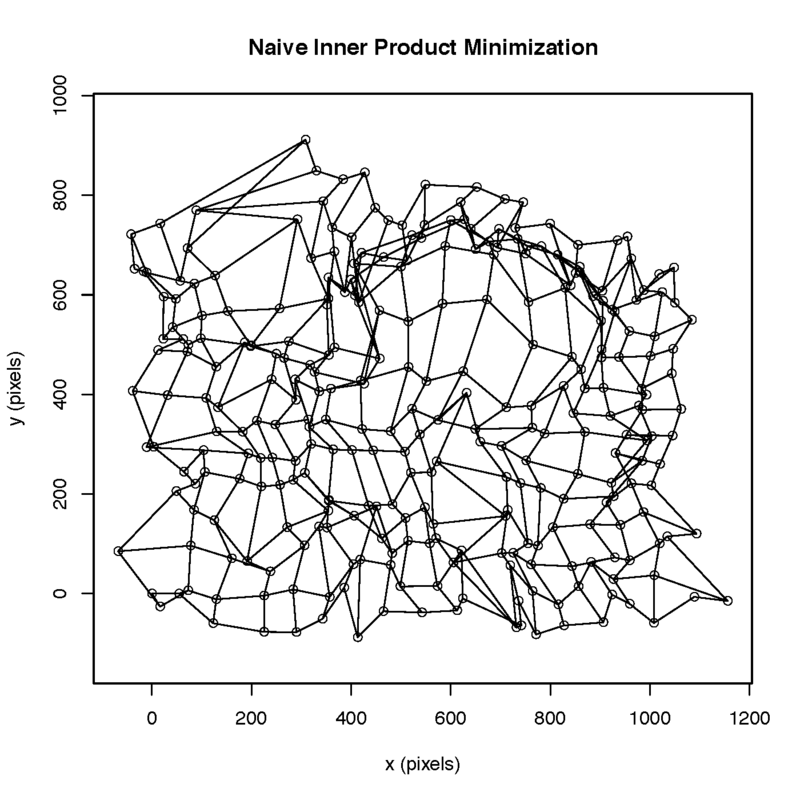 The transformation Jacobian under the affine extrapolation. 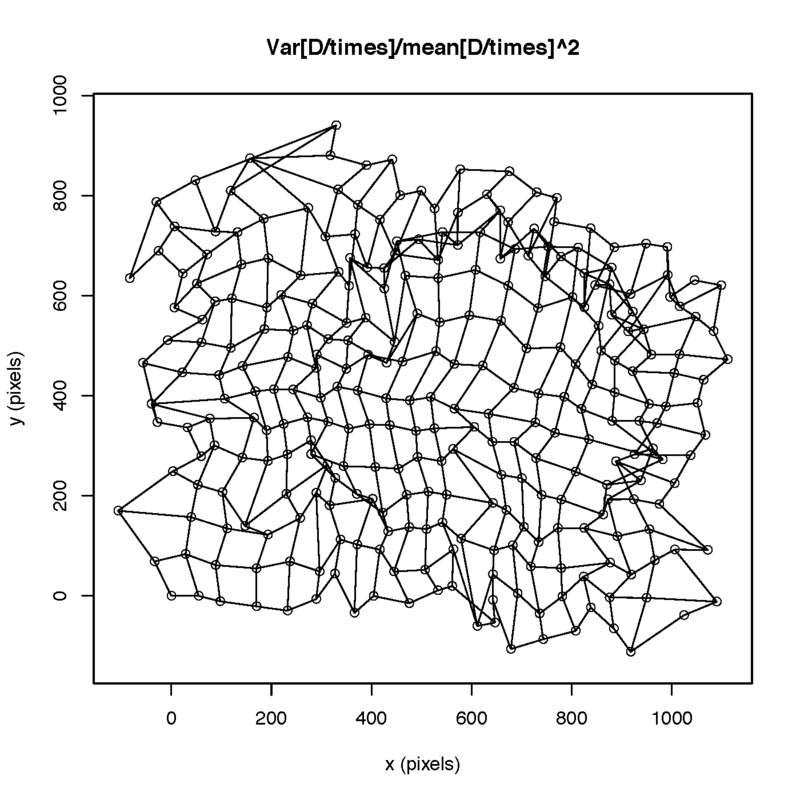 The transformation Jacobian under the cubic spline extrapolation.